Our aim to build a complete list of gigs at the Top Rank. Here’s a start but we need your help! 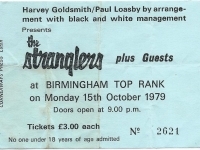 Ron Brinsdon sent in this ticket stub of The Stranglers gig at the Top Rank and Brian sent in this ticket stub from The Jam gig. Scurry away to research..Clash, Coventry Specials, prob Spizz, Suicide. Beat, Selecter Body Snatchers?, Clash again, Mikey Dread. Hmm need to look out some ticket stubs. Leo Sayer also supported Roxy Music at the venue – when his clown look was en vogue! PS can we have some more on The Carlton that became Mother’s – Pink Floyd recorded an album there – Ummagumma – in its Carlton persona The Kinks played there among many others – cheers! Good old Leo! Definitely more on the Carlton, Mothers gets all the glory! 1977 The Ramones supported by the Boomtown Rats, I bumped into Bob Geldof that afternoon having his photo taken outside the Irish Tourist Board, which was around the back of Rackhams. hey, I’ve got that ticket too!! 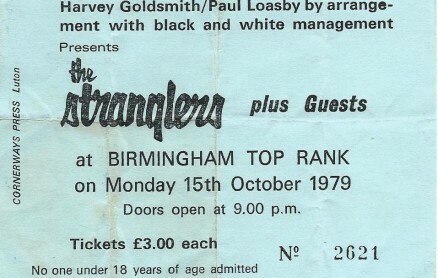 I recall seeing the Stranglers too…..and used to enjoy the Two Tone nights on a Monday night. At the time I worked for Dillons newsagents as a relief manager and often I’d be knackered on Tuesdays as it was more or less straight out of the Top Rank, a quick bath and then to work to open the shop, and organise the paper rounds! Saw The Clash there along with Richard Hell and The Voidoids. Spizz got thrown off stage by the roadies. The Clash performed under a deluge of phlegm and afterwards I saw Don Letts at the rear of the audience. Dunno if he’d been filming. 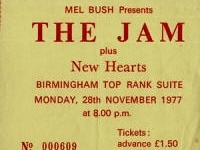 On another occasion I saw The Jam there. Remember the gig well, the Slits opened up the night. I also remember security taking pins/badges/chains etc off everyone going in, putting then in plastic bins and then at the end of the gig, you’d try to find your stuff!! I also remember Kevin Rowland standing behind us, he still would have been in the Killjoys at the time. I saw Steel Pulse around 76 give or take…before they released Handsworth Revolution…AIi Campbell and Astro were there a few yards away from me! A brilliant venue. I saw Siouxsie & the Banshees/Athletico Spizz 80/Altered Images there on October 22nd 1980. 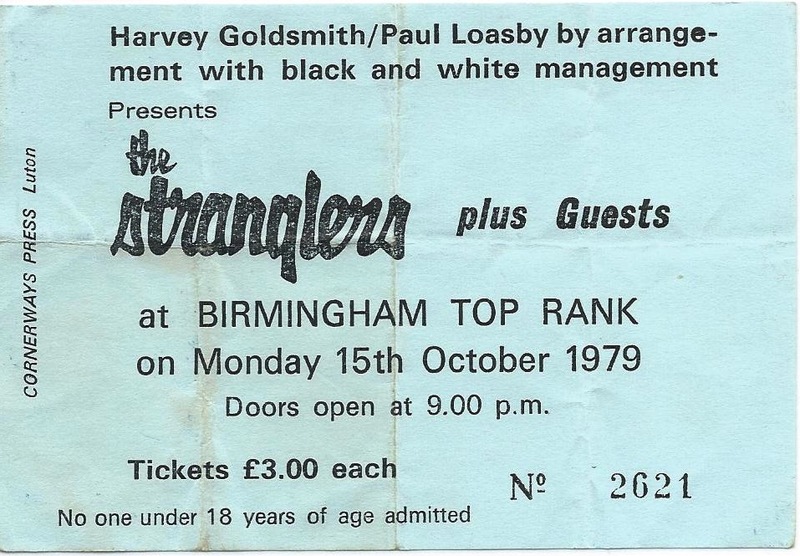 It was an electrifying gig, although marred with the usual gobbing and beer chucking which was the way of things with punks in those days. I remember Altered Images drummer leaving the stage half way through the set when he was struck by something thrown from the audience. Also, Spizz was in a poor mood with the spitters – at first playfully firing a toy rifle at them and then getting quite cross. The Banshees were very powerful that night – the monitors broke down during ‘Clockface’ and the audience did an impromptu version of the song, much to drummer Budgies delight, who joined in. Siouxsie soon got pissed off with the spitters as well though, threatening to leave the stage & not come back if they didn’t pack it in. Amazingly they calmed down & allowed the band to finish a quite brilliant set. I also saw the UK Subs/The Stiffs/Anti-Pasti there on 27th Feb 1981. Another very good and vibrant gig. Anti-Pasti had a lot of bother with the drum kit falling apart but they struggled on. The Stiffs were beer canned off the stage when the lead singer took one full in the face. Amazingly, they came back on & finished their short set. The UK Subs were very good and interacted with the crowd brilliantly. 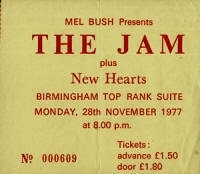 The Kinks played there, sometime between late 1970 and early 1972 (sorry, I have no firmer date than that! – but it definitely happened). Iron Maiden – 2 March 1980. I used to go in the late 60s and saw The Troggs there. Booker T and the MG’s ??? Same music each time but can’t remember what it was. Was usually a disco, soul , Motown. To add to the list, AC/ DC I’m pretty sure they played there in 1977 or 78 for the Let There Be Rock tour. I know a punk mate who was at school with me at that time saw the Boomtown Rats there supported I think by a band called The Yachts. I also saw It Bites when it was the Hummingbird.